How would you like to have the entire collection of Sierra rifle and pistol bullets at your fingertips, complete with bullet Ballistic Coefficients (BCs) and parts numbers? Well we’ve got you covered. Sierra publishes a handy PDF chart that displays all of Sierra’s popular projectiles, from .20 caliber all the way up to .50 caliber. 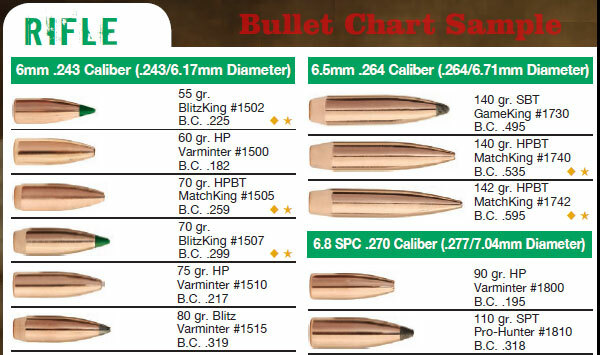 CLICK HERE to download Sierra Bullets Chart. You can also get a free, hard copy poster with all Sierra’s bullet types. The current Sierra Bullets catalog has a printed insert that folds out into a large poster for your loading room or workshop. To order the current Sierra Catalog (with fold-out poster), visit Sierra’s Catalog Request Page. 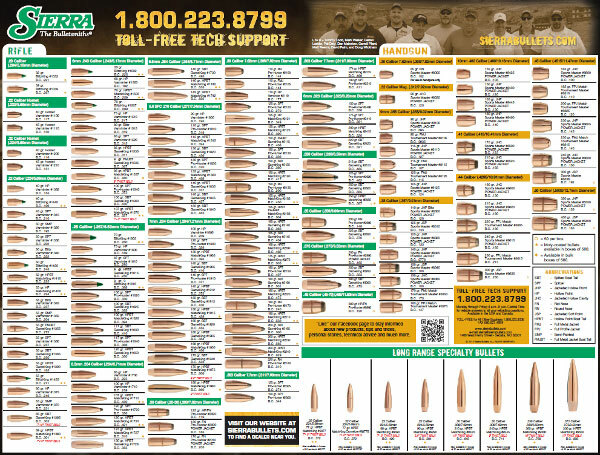 Share the post "Get Free Sierra Bullets Info Chart"
I am looking at reloading a few different calibers of rifle shells with my boys. The calibers are 243,270,308 & 300 winchester mag. I’m trying to figure out what sort of projectiles and powders will work commonly within these calibers so as to save on costs. Imr 8208 could work for you.